Why Worldwide Free Shipping Make Sense For China Seller? Does this make sense? Do they still make profit? The fact is, China seller can make profit at most cases, at least not at a loss. The buyer will never be cleverer than the seller. As you know, you pay for it, including the small product, the delivery charges and other relative fees. So here’s the further question, the cost of product and shipping would be so cheap? 1. The product is cheaper than you can imagine. Everyone knows that the phrase “Made in China”. China’s goods are inexpensive due to lower labor costs and mass production. But how cheap are these items? Let’s take an example to give you a clear idea. 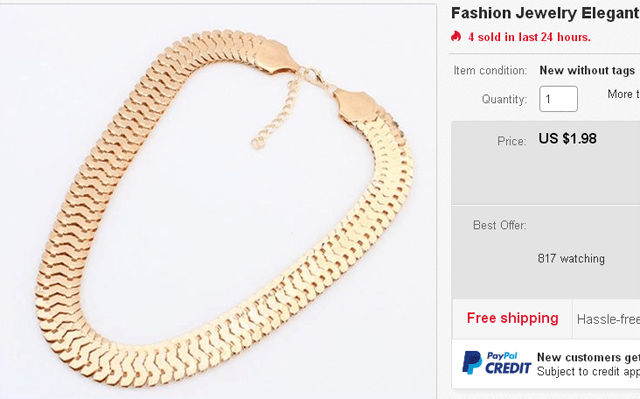 You shop on eBay, and find some jewelry or accessories shipping free with a low price. In this case, it’s US $1.98 per piece. You pay $1.98, wait for several days, and you will receive it at your doorstep. Let’s find out the seller’s cost. You may know Taobao.com, which is a Chinese C2C website. 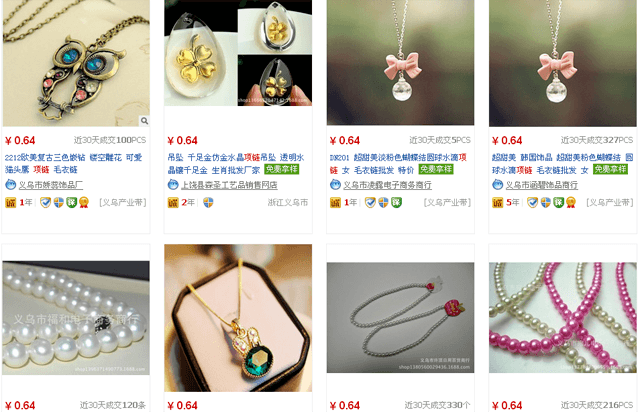 The price is low there, but we’ll provide another source 1688.com to check similar jewelries’ price in CNY. Now, you saw it. There are many kinds of small jewelries worth ¥0.64 per unit, that’s about $0.1. Wait a sec. It’s not the bottom line. The $0.1 is the price everyone can enjoy. If one has a close connection with a producer, he/she can get a better discount instead of the listed price on the website. Not all free shipping jewelries are so cheap. This is just an easy simple reference. Buying directly from China are more competitive especially for those items needing many handy work. And small handy items are more likely to afford a free To-Door service. 2. The shipping cost is cheaper than you can imagine. You see a price of a desired item and want to buy it, while after looking at the shipping cost, sometimes you are slapped into the face. Buyers especially love free shipping; many will only purchase items that ship for free. In fact, buyers are more likely to choose an item with free shipping over an item with a shipping charge, even if the total cost is the same. As you may aware, any delivery charges are always included in what you have paid. But do you know ship anything from China to U.S., is much cheaper than ship from U.S. to China? It’s based one same carrier. China seller even has better options. They use China Post or Hong Kong Post to handle the delivery. This is the cheapest carrier but also the slowest. Hone Kong Post is even up to 50% less than China Post. Compared to international express courier (such as UPS/DHL/TNT/FedEx) 3~5 days, the post transit time can last 3~5 weeks. Though more time needed, most buyers won’t expect to receive in the next day, if they choose buying direct from China. More luckily, the seller’s location near Hong Kong. He/She may choose a freight forwarding service to bring the goods to Hong Kong and ship from there. Besides, they send bulk, or consolidating with other items to the same destination. That small box you received was sharing the same plane with thousands of others transported to your city. Low labor cost in China Post. The developed traffic center with high ratio of automation in Hong Kong Post. Since the postal services are run by the government, they can be funded or bear a certain amount of loss. Contracts between Country-Country, eBay, China Post, USPS or so. Some Chinese sellers must be running very low profit margins just aiming for positive rates. While some of them make a good profit both from large quantity and very low-cost sources. There is no free lunch, even transport from a city in China to the nearer one cost ¥5. Worldwide free shipping isn’t a key point to determine your buying choice. Just lower your expectations with these small items, you’ll be satisfied. If you want to buy bulk goods from China, then you may consider our forwarding services of sea freight or air freight. Let us know if you need any assistance.